There I was, strolling through Yes! Organic Market when I came across a smiling man. He coaxed me into trying his chocolate and in minutes, I was hooked. Who was this strange man and how did he get into the chocolate making business in DC?! Adam Kavalier is his name and Undone Chocolate is his game. He was in graduate school studying medicinal plants for his PhD when he discovered antioxidant-rich cacao. He and his wife, Kristen, began experimenting with it and soon discovered how marvelous it could be. And just like that, Undone Chocolate was born. Today they work out of Union Kitchen, a food incubator located in DC, where entrepreneurs can make their dreams come true. Their current product line includes four different bars. 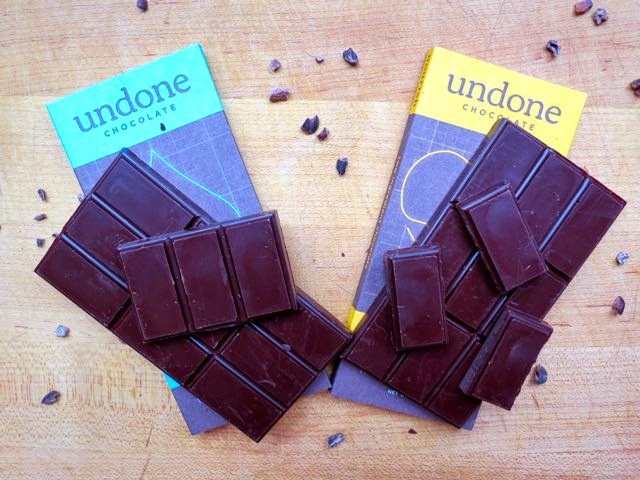 Their most expensive bar is the one made with 74% cacao from Matagalpa, Nicaragua. 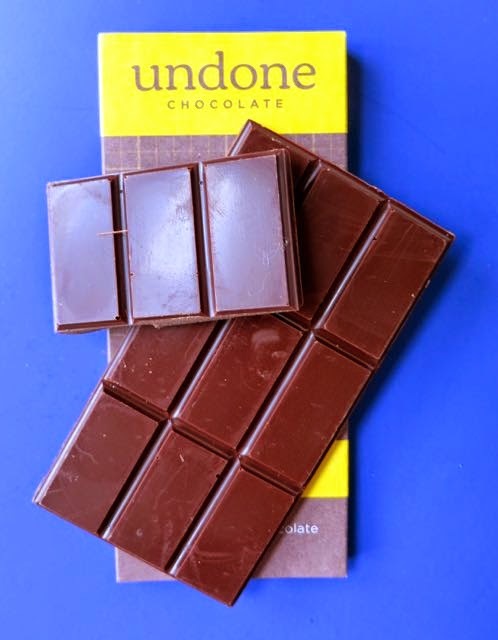 This two-ingredient bar has just the right balance of cocoa beans and organic cane sugar that leaves your mouth watering and wanting more. It is mild and balanced. The other three have similar packaging. My favorite is the Arouse! 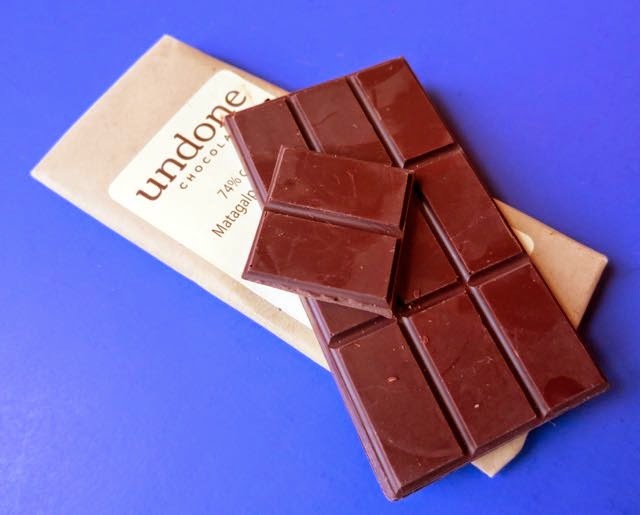 This 70% cacao bar is also just made with organic cacao and cane sugar, but the addition of cinnamon, cardamom, and chili gives it the oomph I like. Upon first bite, it is the cinnamon that you taste. It starts to coat your mouth and as it melts down your throat, it finishes with the spiciness from chili that leaves your throat tingling even after the chocolate has been consumed. 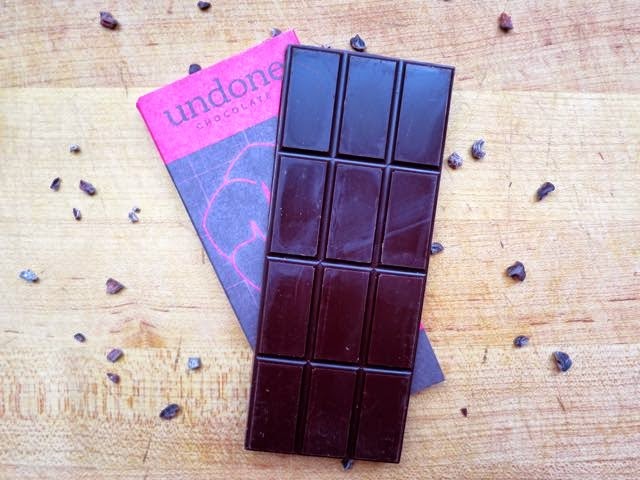 The Replenish bar is that same well-balanced mix of cacao and cane sugar with Himalayan pink salt. A little salty with your sweet is always a great combination. And last, but not least, is the Nourish, which is another plain 70% chocolate bar -- no salt or spices. This one seems the boldest and creamiest as it will just melt in your mouth as visions of sugarplums dance in your head. Best of all, they describe the origins of their chocolate and their commitment to fair trade on their website giving you piece of mind that your purchase supports a fair economy in Central America and the Caribbean. 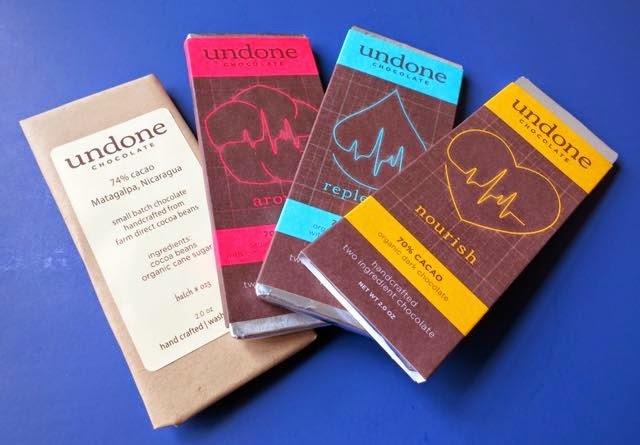 These bars along with their cocoa can be found all over DC in various stores like Yes! Organic Market, Each Peach Market, and Glen's Garden Market. Soon, it will be in MOM's Organic Market as well. The chocolate bars retail from $8 to $10 each. And your purchase goes towards supporting a thriving business with budding entrepreneurs in DC. To buy them online, click here. Remember, chocolate can be very good for you as it is antioxidant rich, but only in its purest form and without a bunch of non-natural additives. And with that, I think I'll undo another wrapper of Undone Chocolate and savor the flavor of real roasted chocolate.